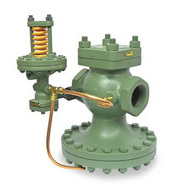 Spenc Pilot Valves & Spence Pilot Regulators | ALB Industrial Supplies, Inc.
Spence Engineering offers a wide range of pilots and accessories that work in conjunction with the Regulator line. These pilots and accessories give you the ability to customize your regulator to meet your specific application. Spence regulators are designated by a letter representing the main valve followed by letter representing the pilot. A number indicates a modification to either the pilot or the main valve, whichever it is immediately after.